With summer finally in full swing, now’s the time when many employees think about taking some time off for vacations and summer fun. As an employer, are you prepared? Summertime can often bring challenges for many companies struggling to fill staffing gaps caused by vacations and to meet increased seasonal demands as business heats up with the weather. Working with a recruiter such as Appleseed is a great way to take care of what could be a messy situation. Given the current national employment situation, summertime help doesn’t necessarily mean being limited to just high school and college students looking to fill a couple of summer months. There are any number of qualified and motivated potential employees out there available now, into the fall and beyond. Summer is here. For college and high school students and teachers, it’s a great time to get a summer job that can put some extra cash in your pocket and even help you discover new interests and opportunities through summer and part-time employment. Business are hiring. Last year more than 6,000 jobs were created in Central Mass, according to the executive Office of Labor and Workforce Development. This offers those looking for summer jobs, part-time employment, and temporary work more flexibility and options. At Appleseed we work with students, teachers, families with children needing more flexibility, and retired folks wanting to work with flexibility. . We have employers who need additional seasonal help for busy summer hours as well as temporary full-time and part-time employees to fill in the gaps caused by vacation time. Welcome to the newsletter section of our website. We are excited to share all kinds of things with you. Every month you will find helpful information regarding job searches, resumes writing, interview techniques, and more. I will be adding a section each month that I am calling “Mae’s Mind”. I am going to share with you, all kinds of things! This month we will start with a Thanksgiving Day quiz. See how fun this is going to be? When was the first Macy’s Day Parade? What is the top turkey producing state? How long did the first Thanksgiving celebration last? What year did congress pass a law to celebrate Thanksgiving on the 4th Thursday of November? The staff at Appleseed Personnel wishes each of you a very Happy Thanksgiving. If you or someone you know has banquet or wait staff experience, we will have several upcoming events during the holiday season. Great for college kids home for break! Contact the office for more details. We are looking for someone with deli experience for a one month (December) assignment. Our best advertising always comes from our many happy employees. 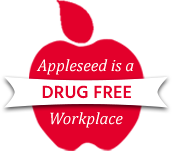 If you have had a good experience with Appleseed, please tell us (and everyone else) about it on our Facebook page. Helping people find employment has been what we do and love for 32 years. Thank you for being a part of it. Hiring is on the rise, are you ready? Your resume is an important job search tool. Make sure you double check for spelling errors! That document represents you before you get the chance to meet with an employer, it needs to do a good job. If you are in need of a resume review, call the office, we can help. Giving back is a term that has gained popularity in the last few years. I am so glad it has, but often wonder if people really understand how easy it is to do. It is my firm belief that what you give to the world is what you get from the world, and strive to live my life accordingly. Sometimes that means I have money to share with someone who has none. Sometimes that means I take time out of my schedule to be helpful to someone in need. Sometimes, it simply means I smile and say hello to a stranger. It isn’t what or how much you give, it is that you GIVE. It’s easy to get caught up in our own lives and our own struggles. Try smiling and dropping some change in the red buckets that line the malls and plazas this time of year. Smile at someone. You will feel good, I promise! Simple, kind deeds and actions make a difference, be a part of the difference.